Victim is Dalia Lemkos, 26, of Tekoa. 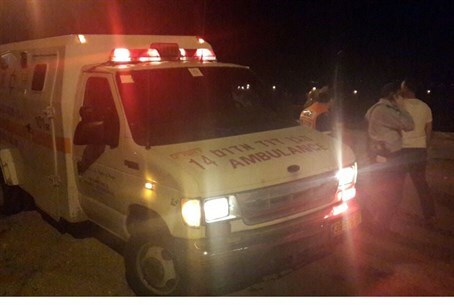 Terrorist shot after second stabbing attack in Israel in 12 hours; two others wounded. Dalia Lemkos hy"d, 26, of Tekoa, was stabbed to death, and two other people were wounded in a terrorist attack at a hitchhiking station outside the town of Alon Shvut in Gush Etzion Monday evening - the second such attack in less than 12 hours. Lemkos died of neck wounds, according to paramedics. Chilling CC TV video shows the terrorist plowing into Lemkos with his car, then returning to stab her. The time of her funeral has not been released. A 26-year-old man who was also stabbed is in light to moderate condition and a 50-year-old was hurt in the jaw and is in light condition. Witnesses say the terrorist tried to run down his victims with a car at first, but failed, and then got out of the car and began stabbing. The guard at the gate of the community of Alon Shvut came running to the scene of the rampage and shot the terrorist in the chest several times. Police said the terrorist was evacuated to hospital with serious injuries. He has been identified as Maher Hamdi al-Hashalmoun, a resident of Hevron. The bus station where the attack took place is the same one at which Israeli teens Eyal Yifrah, Gilad Sha'ar and Naftali Frenkel were abducted earlier this year before being brutally murdered. The attack is the second stabbing in six hours, after a Palestinian worker stabbed a 20 year-old IDF soldier in Tel Aviv. The 20-year-old victim of that attack is currently in critical condition after being stabbed numerous times, including in the upper body and waist, as he tried to fight off his attacker. His attacker was chased down and by police, and has been identified as Nur al-Din Abu Hashiya, an 18-year-old from Shechem (Nablus) in Samaria who had illegally entered into sovereign Israeli territory - one of countless other illegal Palestinian workers.